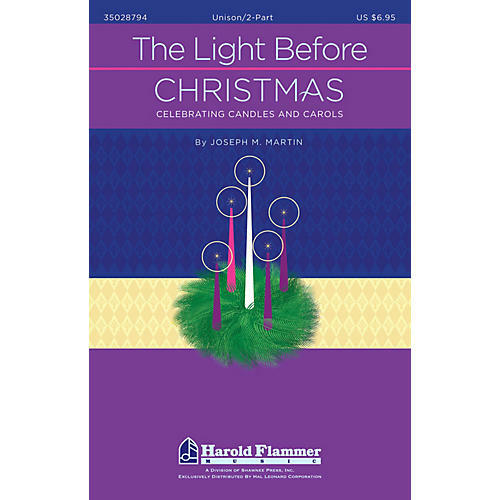 Written especially for older elementary choirs and younger youth choirs (grades 4-8), The Light Before Christmas celebrates Advent's joyful anticipation of Christ's birth. The five candles of the Advent wreath provide the central focus for this service of light that culminates in the lighting of the Christ candle and the arrival of Christmas. Highlighting Advent's messages of hope, peace, joy and love, this unique work may be presented as a full musical or individual songs can be performed as featured anthems during the Advent/Christmas season. New songs, familiar carols, and thoughtful narratives join together to create a truly memorable worship experience filled with the expectation of Christ's coming and the celebration of His birth. A full line of support products is also available that make the learning process and presentation a breeze. Performance Time: 25 minutes. Songs include: The Wonder of Advent; Hope Is Like a Candle; A Prayer for Peace; Sing for Joy, Children of Light; Look to the Light; An Echo Carol of Praise. ScorePlay - click to view score with recording.